My pal Tara and i have been out running - just 2 days after my last 10K. We ran along the river and did some exploring and accidentally ended up running 13K! This is what happens when pedestrian walkways on bridges are closed and you're forced to run to the next bridge in order to get back to your car! The boys and the neighbour girls have been having fun with the Spaceship that Chewie has been constructing with B-rad. He wanted to paint it one day after school and i told him i didn't have any paint for him. He told me: "Mom, you have lots of paint downstairs in your art room! we can just use that!" Cut to: Me making a bee-line to Michaels for some poster paint... here you go, kids, go nuts. Painting speed lines on the space ship. I also had the pleasure of teaching a beginners Zentangle class this week! 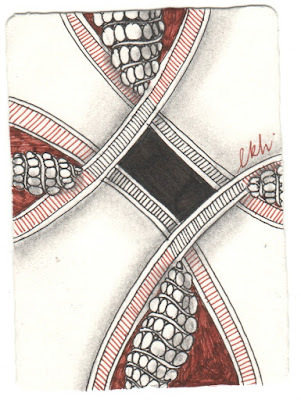 It was really great, and i always enjoy sharing my love of tangling with new people. I don't teach as often as many CZTs out there, so when i get a chance to it's pretty awesome for me. And i still get nervous. Every time. This was the first Father's Day that B-rad has been home in almost 7 years. Usually this is when he and his brothers and their dad go on their annual boy's only fishing trip - but because of the wedding they had to reschedule. So Sunday morning the boys and i made B-rad some Father's Day breakfast in bed. Artoo serenaded B-rad with a very lovely "I Love Dad" song that he wrote, and the boys gave their dad the cards they made. This is the sign of a good father. These two little boys are so lucky to have a dad like B-rad. He's really great, always there for them - ready to play and help them create the things they've imagined. We're all pretty lucky. 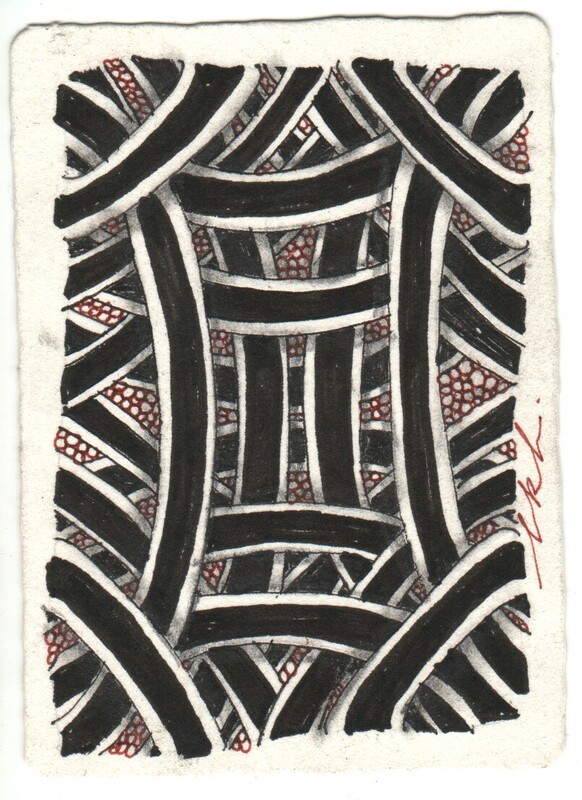 Weekly Challenge #223: "Official Tangle - UMBLE"
In the latest Zentangle newsletter (click to subscribe) Rick and Maria shared with us the step-outs for an oldy but a goodie called Umble. They also talk about how the inspiration for the tangle doesn't necessarily look like the tangle itself. The challenge this week is to try out the New-Old tangle: Umble! You can do a monotangle or just a regular old tile with umble somewhere on the premises. 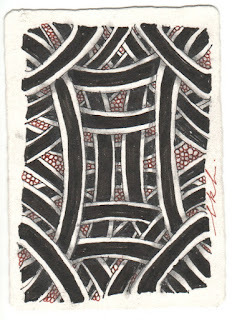 It's quite a fun tangle to use - and it's done in the same style as Hollibough using the Drawing Behind method. Have fun with Umble! Let's see what ya' got! Thanks Laura for another challenge! Your post is so full of love for B-rad and your boys, always GREAT to read. I had a feeling it was going to be Umble this week! Nice challenge. Another great challenge! Thank you! I'm amazed by your stamina! Loved the challenge. Thank you! This is fun. Thanks again for a most umbling and ultimately rewarding challenge. I never tried this tangle before I just kept passing it over. I am glad you had me try something I did not think I would like. I love it now! Laura, congrats on your 13k! I have to say, the pic of Artoo a B-rad, .......Just adorable!!! A little mini me!!! Wow, that is great dear. Anyway I am also looking for best Lincoln park wedding venues for my wedding celebration. Please help out and suggest some best locations in NYC that can fit in to my budget as well.